First, here are some good books about the battle. Perryville: This Grand Havoc of Battle By Kenneth Noe is a very good book, perhaps the definitive account of the battle. It is one I want to read again. Stuart Sanders has written two fine books about this fight. One is Maney's Confederate Brigade at Perryville . I read this just after a trip to the battlefield, so the names and places were fresh in my mind. That was great - and lucky - timing on my part. It is a very good and quick read about this part of the battle and would be a good book to read right before a trip to the site. His other work is Perryville Under Fire: The Aftermath of Kntucky's Largest Civil War Battle. This is a fascinating look at how this battle affected the small town of Perryville as well as many of the other surrounding towns and rural areas near Perryville in the weeks and months after the terrible event. The Civil War at Perryville: Battling for the Bluegrass by Christopher Kolakowski is a good book about the battle, shorter than Noe's, but very helpful and a quick, easy read. It would be another fine choice to use right before a visit to the field. Company Aytch by Sam Watkins is a really enjoyable read and includes a good section on Perryville. Some of the more famous quotes about this battle came from ?Watkins' story. Of course, the web also provides many resources, as a quick Google search will show. Here are the ones I haves used and recommend. 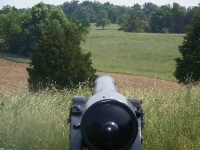 One great website is at Battle of Perryville.com. It provides a really detailed view of the battle, the campaign and pictures of the barttlefield, as well as a list of other sources and information. It is a very informative snd helpful site if you want to read or research the battle online. This would be a great starting point. The battlefield's official site does a fine job of updating current events, programs and information about the park and museum. It is a good resource to check before taking a trip to the park. Perryville Battlefield is part of the Kentucky State Parks system and the parks' website for this historic site is here with good current information about park hours and directions. Here is a direct link to the park system's map of the battlefield and surrounding land. The Friends of Perryville is a wonderful organization working to help out the park, as such sites are not a high priority in the state's budget. Their site focuses on activities they sponsor and on ways they are trying to help support the park. They also have a Facebook page to update ongoing events. Also available is a database of casualties at Perryville, a valuable resource and the product of a lot f work. The Ohio at Perryville blog provides good updates on events at the park, especially the annual walking tour, as well as information on Ohio units at the battle snd other interesting information. The Civil War Trust's battle page includes a summary and couple other nice stories about the battle and the National Park Service's brief summary page also is helpful for a quick overview. I know there are more great resources out there, including a couple of books who focus on the overall Civil War in Kentucky, but these are ones I have read or used and find especially enjoyable and informative. I make sure I keep these on my bookshelf or saved in my list of bookmarks. If you know of any others I should know about, please share them in the comments. Thanks for the mention of the Ohio at Perryville blog! I am off in a few hours to co-lead a Michigan round table tour with Chuck Lott and have posted a couple of recent entries on the blog. Perryville is also my fave battlefield for many reasons, and I hope to be touring with you at Perryville soon! I have long-standing issues with current interpretations of the battlefield. There has been considerable "cherry picking" to make primary sources appear to support historians interpretations. The participants themselves - primarily in the Rebel perspective, relate a very different battle than to modern historians. Some of this argument can be seen at http://civilwartalk.com/threads/understanding-perryville.101144/ over 7 pages of text. I love this battlefield and would love to see the story told the way it should be told. I wasn't there, but clearly recognize that the story the boys told isn't the one that historians tell. I have gathered years of supporting documents and eyewitness testimony. This could literally be proven in a courtroom!! Thanks for your interest in Perryville, and keep up the good work! Thank you. I think I have seen that thread on ?Civil,?War Talk. I'll need to go back and finish reading it. I don't think I read it all before, though I don'r put remember why.